Well I was asked at the last minute to help out at the first annual Music and Arts Festival tonight at Johnny Carson Park in Burbank California where everyone is happy. The park is tucked between Disney Studios and NBC on the south side of town. They wanted me to do a painting demo at the booth for the Burbank Art Association which has been in the city since 1850 and I was the president 2 years ago. Great honor. So I packed my painting gear along with some acrylics and tucked it all into my traveling bag and hopped on my bike and rode off for the night show. They had a band playing with great music and canopies with a lot of different arts organizations there. At our place we were painting for the people. I love this! It's a great art style, it looks like a real painting. 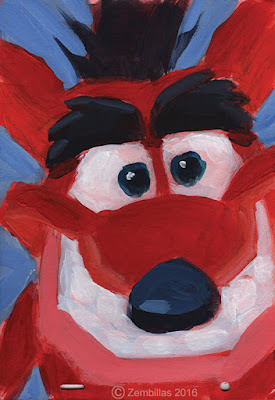 I still think that your modern design for Crash could work perfectly for a new game. I still find it strange that Vicarious Vision didn't contact you or Joe Pearson for the remastered of the original three games, considering that they did it for Crash Nitro Kart. Also they could have done a more fleshed out story for Crash 1, as it was intended. They could have asked David Siller to join the crew too and bring back all the elements from the bible that never made into a game. It would be awesome to see a proper backstory for all the characters and their personality play out in cutscenes or even during boss battles, with dialogue and cinematics. Thank you too Gabriele. When it comes to creatively contributing to Crash it is what it is. I'm aure the people working on it now are going to do a good job. Still waiting for the day that I can own your art! Great work as always. I saw your designs at the first link you posted. It was in the comment you deleted. So yes I think you did a fine job there Hazman. You captured the look and spirit of the characters with a minimalist approach. That's a difficult thing to do and you did it. Very good! The first game I worked on was the first Crash game for PlayStation i the mid 90's. The only other game characters I worked on were for Sonic and Mario for their TV cartoon series in the early 90's. No experience with 8 or 16 bit game design. You would do well in that area. Thank you very mach Charles! Yes if you say it like that I guess I wouldn't mind being a bit of a sprite designer, There's a lot of new games that are based off of old school 8 and 16-Bit games. Like shovel knight, Super meat boy, Fez, Cave Story and Undertale. Charles, I'm a big fan of you and your work. Can I have your Email? Othman thank you for your comment. Go to my school's website TheAnimationAcademy.com and click on the Contact tab. Send a message and it will get to me.